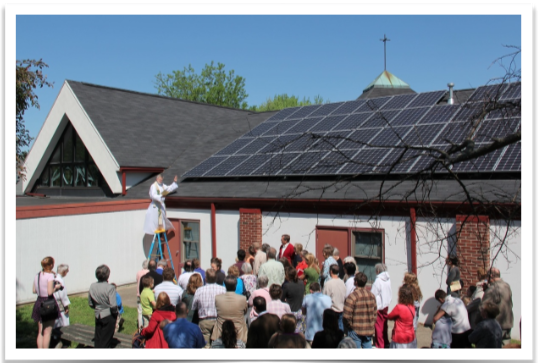 St. Thomas Lutheran Church has an ongoing commitment to Creation Care, and to climate action through their involvement with Hoosier Interfaith Power & Light, that has changed how they think about their property. They have redesigned and replanted the foundation plantings, added and expanded the prayer garden, and created a community garden to donate food to Mother Hubbard’s Cupboard. Their commitment to being good stewards of the Earth has also changed their approach to building maintenance and remodeling. The Green Team has kept them on track to be as green as possible with respect to roofing, insulation, windows, and other construction details. Redesigned sanctuary lighting utilizing energy efficient LEDs lowered carbon emissions from 15 tons to 1 ton. The LEDs are expected to last 40 years, and they provide much brighter lighting. Their commitment to Creation Care is changing the ways the congregation relates to the community and to Indiana. In 2013, with the help of a grant from the Indiana State Office of Energy Development and contributions from members, they installed a 104 panel, 27 KwH solar array that is now generating 66% of their electricity while saving $4,000 a year between direct savings and selling renewable energy credits. The system will pay for itself in just six years. Now other congregations are coming to understand the good work being done, and they’re not done yet. With additional improvements, St. Thomas plans to reduce its carbon footprint a total of 50% from the 2008 baseline, and clearly finds joy in stewardship.